Histone deacetylase 5 (HDAC 5) antibody recognizes histone deacetylase 5, also known as antigen NY-CO-9. This antibody has been extensively validated for western blotting using whole cell lysates. Rabbit anti Human histone deacetylase 5 antibody recognizes histone deacetylase 5, also known as HDAC5 and antigen NY-CO-9. Histones play a critical role in transcriptional regulation, cell cycle progression, and developmental events. Histone acetylation/deacetylation alters chromosome structure and affects transcription factor access to DNA. The protein encoded by HDAC5 belongs to the class II histone deacetylase/acuc/apha family. It possesses histone deacetylase activity and represses transcription when tethered to a promoter. It coimmunoprecipitates only with HDAC3 family member and might form multicomplex proteins. It also interacts with myocyte enhancer factor-2 (MEF2) proteins, resulting in repression of MEF2-dependent genes. HDAC5 is thought to be associated with colon cancer. Two transcript variants encoding different isoforms have been found for HDAC5 (provided by RefSeq, Jul 2008). 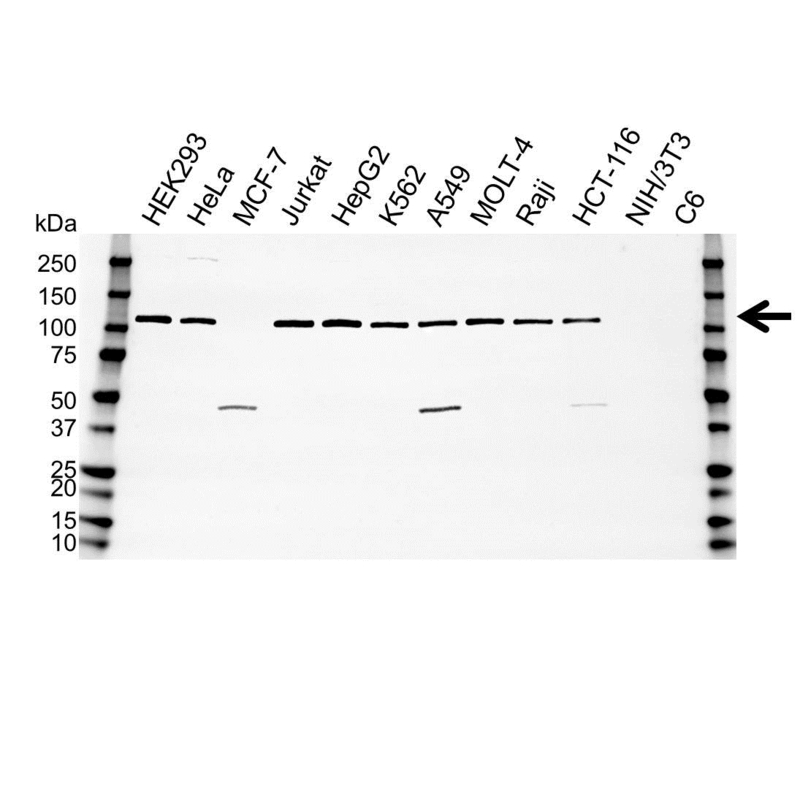 Rabbit anti Human histone deacetylase 5 antibody detects a band of 124 kDa. The antibody has been extensively validated for western blotting using whole cell lysates. Anti histone deacetylase 5 detects a band of approximately 124 kDa in Jurkat cell lysates.